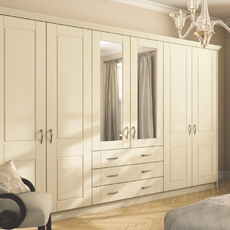 We offer a professional independent service to the fitted bedroom, sliding wardrobe and home office industry. With over 30 years combined experience in Design, Planning, Creating & Installing. 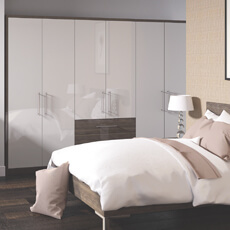 The knowledge and experience we have gained guarantee a professional service from Chichester Bedrooms at every stage. The products we use are high quality with soft closing mechanisms and Gliding technology. Our design service is flexible with appointments available at your home or in our design studio. Covering Chichester and the surrounding areas we will bring you a selection of samples of your favourite door designs and handles. We offer a 3D computer design service so your bedroom can become a virtual reality. If you wish to view the quality of our products and gliding technology in action please book an appointment for a demonstration at our Studio, set in the heart of Chichester. You will find us in the beautiful quaint setting of Drapers-Yard, next to Clothkits. We don’t have a huge retail showroom or overheads to match so we can guarantee our fitted prices will be substantially more affordable than any national or retail high street competitor. This could save you hundreds of pounds without compromising on the furniture quality of your fitted bedroom or home office, which comes with a 6 year guarantee. Jo has a passion for creativity, design and project management. With and HND in Design & 18 years experience as a Bedroom Designer she has the skills to listen to your ideas, create your design and organise everything required for a successful installation. Following her natural flair for interior design Jo has helped over a thousand clients to solve their storage needs within the fitted bedroom, sliding wardrobe and home office industry. Greg started his working career completing a 4-year apprenticeship at British Aerospace. Having worked in some of the biggest airports in Europe as an aircraft mechanic his attention to detail is no less than perfect. With his vast amount of experience and practical accurate skills the avenues opened up and he chose to move his skills into the Fitted Bedroom industry over 13 years ago, excelling in manufacturing, surveying and installation. Together the owners of Chichester Bedroom Limited have the experience and full skill set to offer you a 5 star service to design, create & install your furniture. We only use well-established, high quality, award-winning products and suppliers which enables us to execute every installation as a great success. We pride ourselves on clear information, honest pricing and regular communication. If you have recently had a quote from another company why not bring it to us so you can compare not only the price difference, but view our wonderful quality.